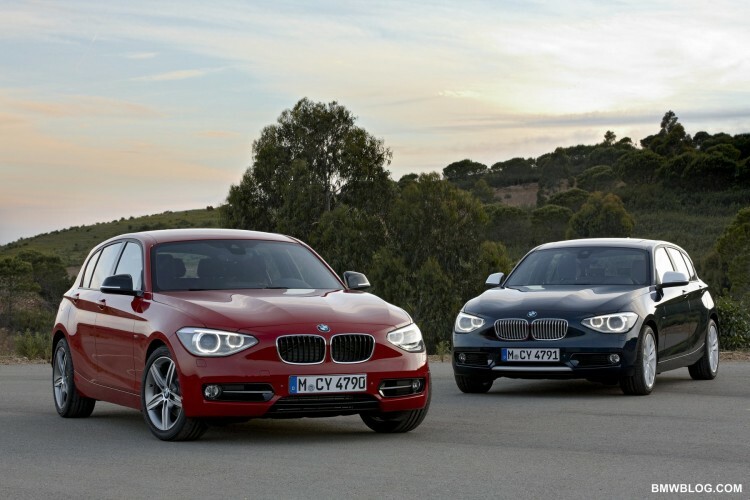 The new BMW 1 Series: the second generation of this pioneering premium compact range. Still the only rear-wheel-drive model in its class. Even more sporty and fuel-efficient than before, and significantly more comfortable and spacious. Outstanding interior and exclusive features, occupying a distinctive niche within its segment. Unique combination of premium-quality handling, aesthetics and innovative technology. Five doors. Bold, swept-back body; uniquely high-quality, sporty design with BMW’s typically elegant proportions and boldly shaped surfaces. Youthful, lively image enhanced by design elements highlighting the maturity and premium status of the new BMW 1 Series. BMW Sport Line and BMW Urban Line provide added scope for personalization using exclusive interior and exterior design features and equipment. For the first time, all the petrol and diesel engines for the BMW 1 Series now feature new BMW TwinPower Turbo technology. 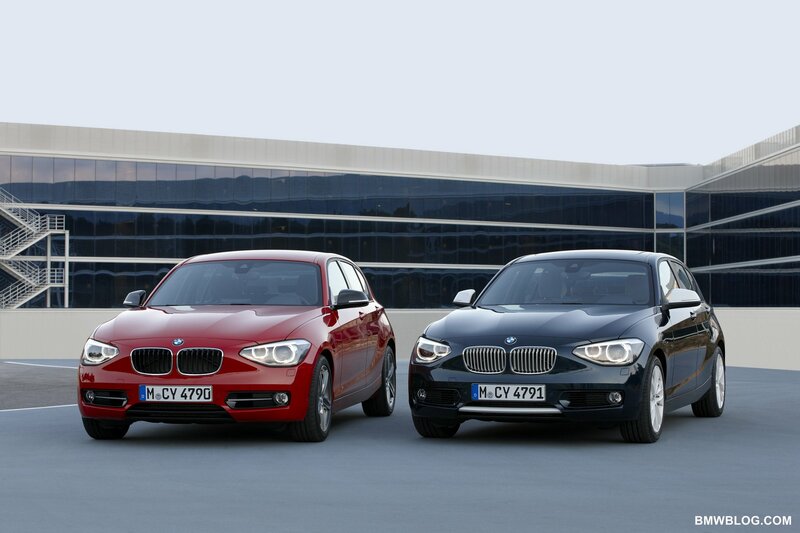 A new generation of 1.6-litre petrol engines: BMW 116i with 100 kW/136 hp, BMW 118i with 125 kW/170 hp. Radically redesigned 2.0-litre diesel engines: BMW 116d with 85 kW/116 hp, BMW 118d with 105 kW/143 hp, BMW 120d with 135 kW/184 hp. Also scheduled for launch soon is the BMW 116d EfficientDynamics Edition, with a 85-kW/116-hp 1.6 litre diesel engine and additional fuel-saving technologies that will keep CO2 emissions over the EU testing cycle down to just 99 g/km. 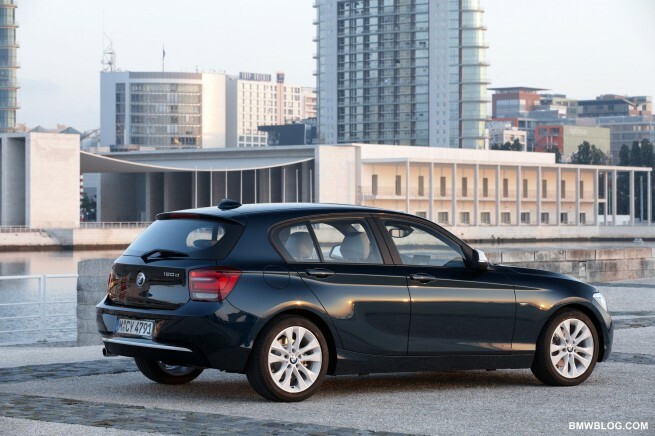 BMW 1 Series still a market leader with its BMW EfficientDynamics technology: first car in the world in its segment with optional eight-speed automatic transmission, Automatic Start/Stop function in both manual and automatic transmissions. ECO PRO mode is activated using the driving experience switch (included as standard). Significantly improved comfort and unique handling thanks to rear-wheel drive, in-line engines, perfectly balanced weight distribution and advanced suspension technology. Double-joint cross-strut front axle; five-link rear axle; high-precision electromechanical power steering with no interference from the drive train. Optional Variable Sports Steering; DSC Driving Stability Control including DTC Dynamic Traction Control and electronically locking rear differential as standard. Body 85 millimetres longer, wheelbase 30 millimetres longer, front track 51 millimetres wider and rear track 72 millimetres wider than previous model; height remains unchanged, but 17 millimetres of increased width create a more spacious interior and a sportier look. 21 millimetres more rear legroom; luggage compartment expanded from 330 to 360 litres; luggage capacity expandable to a maximum of 1,200 litres with rear seats folded down (40/20/40 seats available optionally). Large number of storage compartments, shelves and cupholders in cockpit. Highly torsion-resistant body for increased responsiveness and passenger protection. Comprehensive range of safety equipment including front, side and head airbags. High-quality interior with driver-friendly cockpit and outstanding materials and finishes; optional iDrive system with integral dashboard control display using the exclusive BMW flatscreen design. BMW ConnectedDrive: a comprehensive and (for a compact car) unique selection of optional driver assistance systems and mobility services. High-beam assistance, Adaptive Headlights, parking assistance, reversing camera, Lane Departure Warning including Collision Warning, cruise control with brake function, speed-limit and no-passing information, Internet connectivity, increased smartphone and music player integration, real-time traffic information, and web radio, Facebook and Twitter apps. BMW 118i: Four-cylinder in-line petrol engine with BMW TwinPower Turbo technology package, consisting of twin-scroll turbocharger, High Precision Injection, VALVETRONIC and Double-VANOS variable valve control, capacity: 1, 598 cc, output: 125 kW/170 hp at 4,800 rpm, maximum torque: 250 Nm at 1,500 – 4,500 rpm, acceleration [0 – 100 km/h]: 7.4 seconds, maximum speed: 225 km/h, combined-cycle fuel consumption*: 5.8 – 5.9 litres/100 kilometres, CO2 emissions*: 134 – 137 g/km, emissions standard: EU5. BMW 116i: Four-cylinder in-line petrol engine with BMW TwinPower Turbo technology package, consisting of twin-scroll turbocharger, High Precision Injection, VALVETRONIC and Double-VANOS variable valve control, capacity: 1,598 cc, output: 100 kW/136 hp at 4, 400 rpm, maximum torque: 220 Nm at 1,350 – 4, 300 rpm, acceleration [0 – 100 km/h]: 8.5 seconds, maximum speed: 210 km/h, combined-cycle fuel consumption*: 5.5 – 5.7 litres/100 kilometres, CO2 emissions*: 129 – 132 g/km, emissions standard: EU5. BMW 120d: Four-cylinder in-line diesel engine with BMW TwinPower Turbo technology package, consisting of variable-geometry turbocharger, common-rail magnetic-valve direct injection (max. injection pressure: 1,800 bar), capacity: 1,955 cc, output: 135 kW/184 hp at 4, 000 rpm, maximum torque: 380 Nm at 1,750 – 2, 750 rpm, acceleration [0 – 100 km/h]: 7.2 seconds, maximum speed: 228 km/h, combined-cycle fuel consumption*: 4.5 – 4.6 litres/100 kilometres, CO2 emissions*: 119 – 122 g/km, emissions standard: EU5. BMW 118d: Four-cylinder in-line diesel engine with BMW TwinPower Turbo technology package, consisting of variable-geometry turbocharger, common-rail, magnetic-valve direct injection (max. injection pressure: 1,600 bar), capacity: 1,955 cc, output: 105 kW/143 hp at 4,000 rpm, max. torque: 320 Nm at 1,750 – 2, 500 rpm, acceleration [0 – 100 km/h]: 8.9 seconds, maximum speed: 212 km/h, combined-cycle fuel consumption*: 4.4 – 4.5 litres/100 kilometres, CO2 emissions*: 115 – 118 g/km, emissions standard: EU5. BMW 116d: Four-cylinder in-line diesel engine with BMW TwinPower Turbo technology package, consisting of variable-geometry turbocharger with common-rail, magnetic-valve direct injection (max. injection pressure: 1,600 bar), capacity: 1,955 cc, output: 85 kW/116 hp at 4,000 rpm, maximum torque: 260 Nm at 1,750 – 2,500 rpm, acceleration [0 – 100 km/h]: 10.3 seconds, maximum speed: 200 km/h, combined-cycle fuel consumption*: 4.3 – 4.5 litres/100 kilometres, CO2 emissions*: 114 – 117 g/km, emissions standard: EU5. * EU test figures, variations due to differences in the tyres fitted. 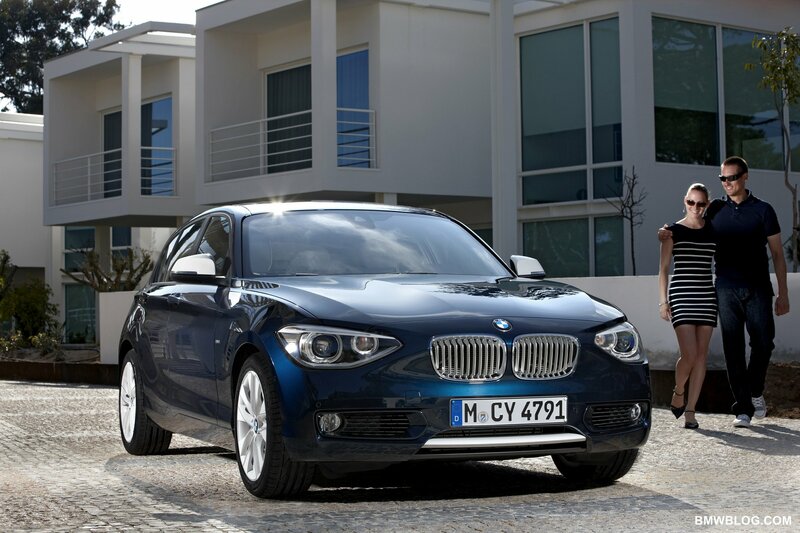 The premium compact BMW 1 Series is already synonymous with driving pleasure. Now, the second generation offers state-of-the-art engine and suspension technology, further improvements in fuel efficiency, significantly more space and an innovative range of features and equipment. Still the only rear-wheel-driven car in its class, it builds on the strengths of its predecessor, which has already sold more than one million units worldwide. With its outstanding handling and design, innovative technology and premium image, the new BMW 1 Series has consolidated its position as a pioneering individualist in the competitive five-door segment. BMW’s entry-level model has achieved maturity, offering an even better balance between sportiness and driving comfort, improved functionality, and numerous driver assistance systems previously available only in higher segments. This is also apparent in its size. The body of the new BMW 1 Series is 85 millimetres longer than its predecessor, at 4,324 millimetres, while the wheelbase has widened by 30 millimetres to 2,690 millimetres. The car also looks more powerful because its overall width has increased by 17 millimetres to 1,765 millimetres (due to an increase in track of 51 millimetres at the front and 72 millimetres at the rear), whereas its height remains unchanged at 1,421 millimetres. The rear seats have 21 millimetres more legroom, and the luggage compartment has expanded by 30 litres to 360 litres. The design of the new generation is a powerful expression of the latest technological advances. The model’s fresh, youthful image has been stylishly updated, with precision-moulded body surfaces and a modern, functional interior both underlining its premium status. Another innovation is the BMW Sport Line and BMW Urban Line, two ranges of interior and exterior design features and equipment that provide exclusive personalization opportunities. All engines in the new BMW 1 Series are four-cylinder models using BMW TwinPower Turbo technology. The petrol engines are part of a new generation, combining an impressively sporty feel with exceptionally low fuel consumption and emissions. The 1.6-litre engines have twin-scroll turbochargers, direct injection, VALVETRONIC and Double-VANOS. 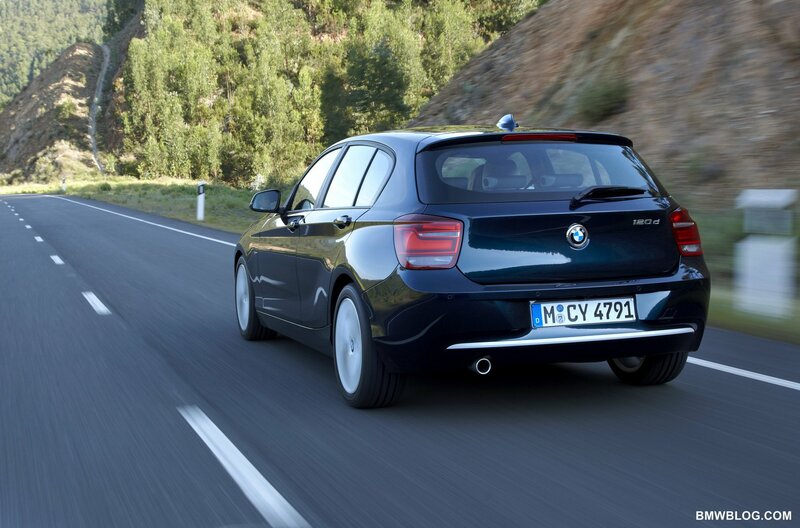 The new BMW 116i achieves 100 kW/136 hp, and the new BMW 118i 125 kW/170 hp. These represent increases of 10 kW and 20 kW on the previous versions, with fuel consumption reduced by up to 10 per cent. The 2.0-litre turbocharged diesel models have been radically redesigned, featuring variable turbine geometry and common-rail direct fuel injection. The new BMW 116d (85 kW/116 hp), the new BMW 118d (105 kW/143 hp) and the new BMW 120d (135 kW/184 hp) have further consolidated the BMW 1 Series’ record of superior fuel efficiency in the compact segment. The new BMW 1 Series is the first and only car in its class to be optionally available with an eight-speed automatic gearbox. Like its predecessor, it also incorporates the extremely wide-ranging BMW EfficientDynamics technology package as standard. This includes the Automatic Start/Stop function, available with both the manual and automatic transmissions, and ECO PRO mode, activated using the driving experience switch (included as standard), for even better environmental performance. 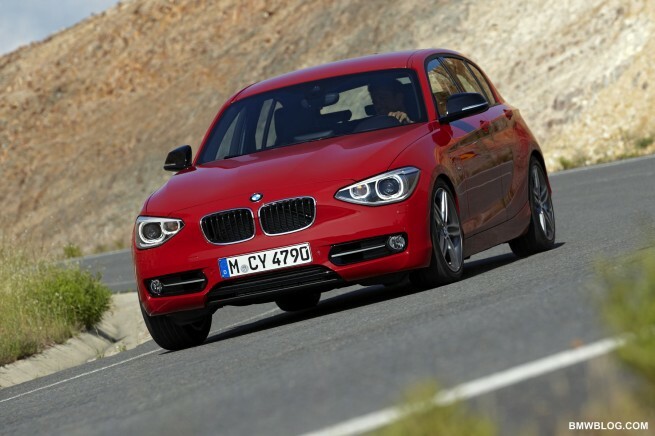 There are also plans to expand the range with the BMW 116d EfficientDynamics Edition. This will have an output of 85 kW/116 hp, but additional fuel-saving and emission-reducing technologies will enable it to achieve fuel consumption of 3.8 litres per 100 kilometres and a CO2 emissions figure of just 99 grams per kilometre over the EU combined cycle (provisional figures). Also unique to this segment is ConnectedDrive, the new BMW 1 Series’ optional package of driver assistance and mobility services. This includes high-beam assistance, Adaptive Headlights, parking assistance, reversing camera, Lane Departure Warning including Collision Warning, cruise control with brake function, and speed-limit and no-passing information. BMW ConnectedDrive also features Internet connectivity, increased smartphone and music player integration, real-time traffic information, and web radio, Facebook and Twitter apps. The drive-train layout, with a longitudinally mounted in-line engine at the front and rear-wheel drive, is unique within the compact segment. This improves the new BMW 1 Series’ handling, and is also reflected in its design, with BMW’s typical proportions: long bonnet, wide wheelbase, swept-back passenger cell. The new BMW 1 Series is the embodiment of responsiveness and innovative elegance in a compact car, with a youthful, lively design and high-quality features adding to the excitement. The front of the car is dominated by the large BMW kidney-shaped radiator grille, boldly shaped headlight units and three-section air intake. The grille is tilted forwards, adding emphasis to the challenging stance of this most sporty of compact models, while the surrounding areas catch the light and create a strong sense of three-dimensionality, with four contour lines on the bonnet forming a V that points towards the grille. The typical BMW double-round headlights have accent trim across their tops. In combination with the optional bi-xenon headlights, this creates a strongly focused look, powerfully enhanced by the direction indicators set into the inner light rings of the headlights and an LED accent light. In another innovation for BMW, the side indicator lights are integrated in the exterior mirrors. From the side, the proportions of the new BMW 1 Series are even more strikingly apparent. The slightly sloping roof line, sporty, angled rear windscreen and flat side windows give the car a coupé-like feel, while the Hofmeister kink – the low forward bend at the back end of the side windows – extends well into the C-pillar, making the door aperture wider and facilitating entry to and exit from the rear seats. The design quality of the new BMW 1 Series, which is unique in the compact segment, is particularly evident in the distinctive BMW lines and dramatically curved surfaces. The characteristic BMW swage line starts at the front sidewall and rises continuously to the rear lights, its boldness giving powerful emphasis to the shoulder area, with the door openers neatly integrated into the swage line. An additional character line below the doors flows sharply upwards into the outline of the rear wheel arch. The sill line provides a similarly dynamic touch, running parallel to the road and then rising steeply at the rear wheel arch, which is nicely echoed by the outlines of the side windows. The size of the rear wheel arches draws attention to its rear-wheel-drive layout which is the reason for its excellent dynamic responses. The wide-set wheel arches reinforce the broad, powerful impression created by the back of the new BMW 1 Series. 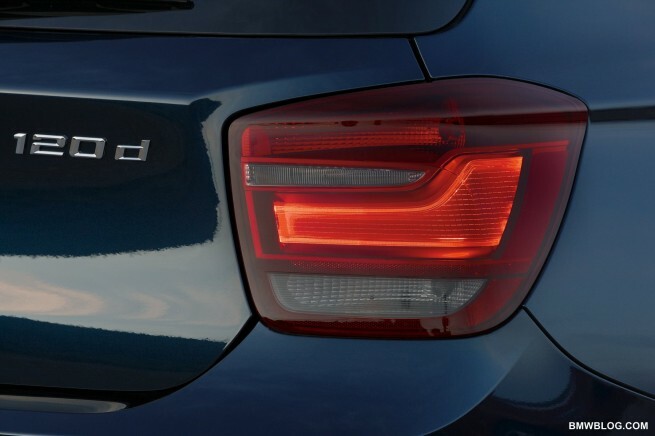 The wide-opening, slightly concave tailgate is opened by pressing the top section of the BMW emblem that sits at its centre, and the rear lights are also set well apart, creating a strong horizontal emphasis that is heightened by their deep surrounds. There are optional xenon headlights, and the rear lights consist of L-shaped banks of LEDs. An additional brake light is set into the roof spoiler. The outline of the rear apron echoes that of the front bumper, while the V-shaped emblem surround leads the eye towards the road surface, emphasizing the new BMW 1 Series’ stable roadholding. Inside, a combination of typical BMW design features and innovative accents gives the new BMW 1 Series a fresh, youthful and modern feel, with a focus on spaciousness and driving pleasure. Lines and surfaces are dynamic and forward-leaning, with high-quality, precision-finished materials reflecting the model’s premium specifications. BMW’s characteristic driver-friendliness is apparent in the angled displays and controls in the middle of the instrument panel, and the ergonomic contours of the centre console, designed for maximum visibility. 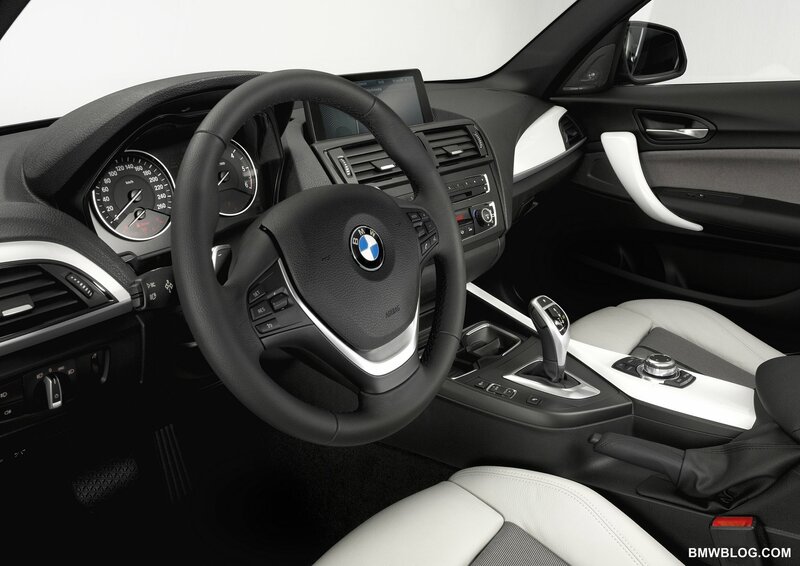 The interior surfaces are layered, another innovation which gives the new BMW 1 Series an organic look and feel. In conjunction with an optional navigation system and the BMW Professional radio, the new BMW 1 Series uses the BMW iDrive system. This comprises a controller on the centre console, favourites buttons and a freestanding flatscreen monitor. The 6.5 or 8.8-inch high-resolution control display, which is integrated into the instrument panel, is used for all information, entertainment, telecommunications and navigation functions. The new BMW 1 Series also offers much more storage space, with large door pockets, two cupholders on the centre console, a roomy glove compartment, and a compartment under the armrest. Bottles of up to 1 litre can be fitted into the lower door panel sections. The exclusive new BMW Sport Line and BMW Urban Line of interior and exterior equipment help to show off the high-tech, dynamic facets of the new BMW 1 Series to best advantage. The BMW Sport Line includes sports seats with specific coverings, leather sports steering wheel with contrasting red stitching, a red keyclasp, adjustable armrests, high-gloss black interior trim and matt coral accent strips. The instruments have specific number and scaling designs. The ambient lighting can be switched between orange and white the inclusion of this feature in the centre console and footwell is exclusive to the BMW Sport Line. Other features of the BMW Sport Line include 16-inch star-spoke light-alloy wheels, black exhaust pipe end trim, and door sill finishers with “BMW Sport” lettering. The kidney bars, the central air intake trim bar, the side intake surrounds and the rear bumper trim are all high-gloss black. Additional options include high-gloss black mirror caps and 17-inch two-tone light-alloy wheels. The BMW Urban Line includes specific cloth/leather seats, a leather sports steering wheel, adjustable armrests, and contemporary acrylic glass interior trim, which creates a strong sense of depth and is available in white or black with matt oxide silver accent strips. A striking effect is also provided by the ambient and courtesy lights, which can be switched between orange and LED royal blue. An additional light source on the B-pillar enhances the effect of the illumination. The distinctive exterior includes specific 16-inch V-spoke alloy wheels or optional 17-inch high-gloss white wheels with an angled surface, and white rear bumper trim. Additional design accents on the front include white kidney bars with chrome-plated fronts and a white trim bar for the centre air intake. The side intake surrounds are painted in the same colour as the car, and the BMW Urban Line also includes door sill finishers with “BMW Urban” lettering and a white keyclasp. White mirror caps are available as an option. 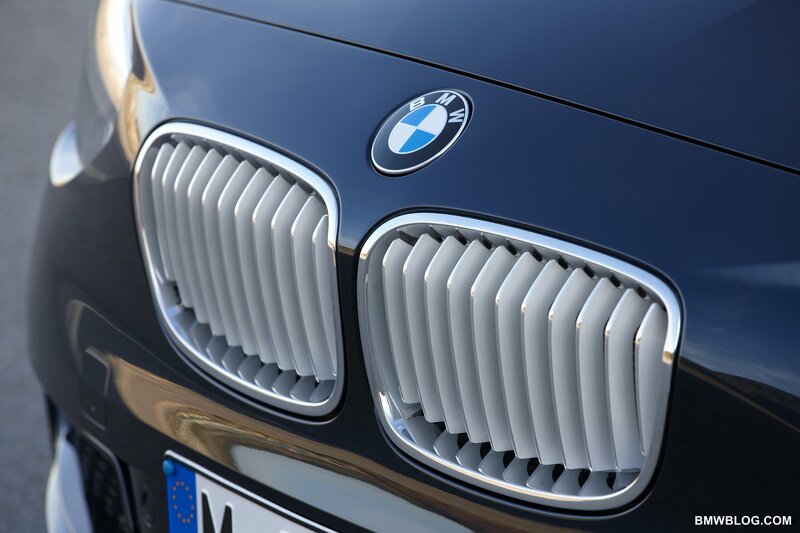 The components of the BMW Lines are matched down to the last detail, and create a striking visual impact. Other individually customizable features include a choice of seat coverings, interior trims and accent strips and light-alloy wheels. Apart from the new BMW Lines, the new BMW 1 Series itself offers additional design and material options. The standard equipment includes satin silver interior trim and Move fabric seats, and among the optional alternatives are additional interior trims and accent panels and Dakota leather seats in a choice of two colours. All upholstery versions are also available for the optional sports seats, and there are currently three standard and five metallic exterior paint colours. The new generation of petrol engines: dynamic power delivery and outstanding fuel efficiency thanks to BMW TwinPower Turbo technology. The new BMW 1 Series is currently available with a choice of two latest-generation four-cylinder petrol engines and three radically redesigned four-cylinder diesel units. The 1.6-litre petrol engines making their debut in the BMW 116i and BMW 118i models use BMW TwinPower Turbo technology, consisting of a twin-scroll turbocharger, High Precision Injection, VALVETRONIC variable valve control and Double-VANOS variable camshaft control. This design is based on that of the multi-award-winning 225 kW/306 hp in-line six-cylinder engine with BMW TwinPower Turbo found in models such as the BMW 135i and BMW 135i Convertible. Like that engine, the new four-cylinder units too are part of BMW’s EfficientDynamics design strategy, which aims to continually increase driving pleasure while reducing fuel consumption and emissions. This is the first time that four-cylinder engines have been fitted with BMW TwinPower Turbo, which represents an exceptionally fuel-efficient way of boosting output. In normally aspirated engines, responsiveness could only be enhanced to the same degree by significantly increasing capacity, and therefore weight and fuel consumption. The design draws on the by BMW engineers’ long experience of building high-performance turbo engines. The BMW 2002 turbo, launched in 1973 with a four-cylinder, 125 kW/170 hp engine, was the first European production car to be fitted with an exhaust gas turbocharger, and is still regarded as a the template for a compact, high-performance driver’s car. In 1983, the first turbocharged engine ever to win a Formula 1 world championship was a Brabham BMW driven by Nelson Piquet. The forced-induction system of the new BMW 1 Series uses the twin-scroll principle, with separate ducts both in the exhaust manifold and the turbocharger itself, each serving one pair of two cylinders. This enables more efficient use to be made of the exhaust pressure waves to drive the turbocharger, so in typical BMW fashion the engine responds instantly to any movement of the throttle. Output is also boosted by VALVETRONIC variable valve control, which is fully integrated into the cylinder head, and Double-VANOS variable camshaft control on the intake and exhaust sides. The patented BMW VALVETRONIC technology steplessly adjusts intake valve timing, rendering the throttle valve of earlier engines obsolete. The amount of air required for combustion is regulated within the engine itself, minimizing throttling losses during gas exchange and improving engine efficiency. The new engines are unusually fuel-efficient, thanks mainly to High Precision Injection. The fuel supply is precisely regulated by magnetic-valve injectors with a maximum injection pressure of 200 bar, positioned centrally between the valves and close to the spark plug. The four-cylinder engine of the new BMW 118i, which has an all-aluminium crankcase, has a maximum output of 125 kW/170 hp at 4,800 rpm, and a maximum torque of 250 Nm at between 1,500 and 4,500 rpm. It is exceptionally responsive, accelerating the car from 0 to 100 km/h in 7.4 seconds and on to a maximum speed of 225 km/h. Improved efficiency is reflected in combined-cycle fuel consumption of 5.8 to 5.9 litres per 100 kilometres and CO2 emissions of 134 to 137 grams per kilometre (EU test figures, variations due to differences in the tyres fitted). The new BMW 116i’s four-cylinder engine provides significantly improved driving dynamics compared to the predecessor model. It has an output of 100 kW/136 hp at 4, 400 rpm and a maximum torque of 220 Nm between 1,350 and 4, 300 rpm. The car takes 8.5 seconds to reach 100 km/h from a standing start, and has a maximum speed of 210 km/h. The new BMW 116i’s fuel consumption over the combined cycle is 5.5 to 5.7 litres per 100 kilometres, and its CO2 emissions are 129 to 132 grams per kilometre. An evolutionary step forward: four-cylinder turbodiesel with BMW TwinPower Turbo technology and even greater fuel efficiency. Wide-ranging design modifications have enabled the four-cylinder 2.0-litre turbodiesel engines in the new BMW 1 Series to build on their competitive advantage in the areas of output and fuel efficiency. These include aluminium crankcases, reduced engine friction, thermodynamically optimized turbochargers and variable turbine geometry, next-generation common-rail direct injection and magnetic-valve injectors. These enhancements represent the latest stage in the success story of BMW four-cylinder diesel engines, which earned the predecessor of the new BMW 118d the title of World Green Car of the Year. The new BMW 120d marks another major advance, with a 5 kW increase in maximum output to 135 kW/184 hp at 4,000 rpm, and maximum torque boosted by 30 Nm to 380 Nm between 1,750 and 2,750 rpm. It reaches 100 km/h from a standing start in 7.2 seconds, and has a maximum speed of 228 km/h. Combined-cycle fuel consumption has been reduced to 4.5 to 4.6 litres per 100 kilometres, with CO2 emissions of 119 to 122 grams per kilometre (EU test figures, variations due to differences in the tyres fitted). The four-cylinder diesel engine of the new BMW 118d has a maximum output of 105 kW/143 hp at 4,000 rpm, and maximum torque of 320 Nm between 1,750 and 2,500 rpm. It accelerates from 0 to 100 km/h in 8.9 seconds, and has a maximum speed of 212 km/h. Its combined-cyle fuel consumption is 4.4 to 4.5 litres per 100 kilometres, with CO2 emissions of 115 to 118 grams per kilometre (EU test figures, variations due to differences in the tyres fitted). Back in 2007, the BMW 1 Series set a new global benchmark, with a unique range of technologies to reduce fuel consumption and emissions being included as standard. 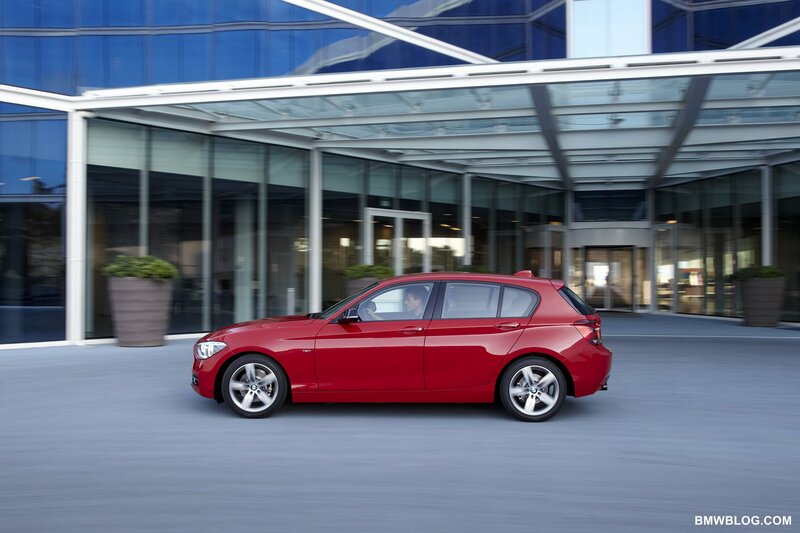 Today, the new BMW 1 Series extends the scope of the BMW EfficientDynamics programme. The diesel versions have a centrifugal-force pendulum built into the dual-mass flywheel to compensate for rotational irregularities and ensure a smooth ride at low revs. The car makes extensive use of intelligent energy management systems, including Brake Energy Regeneration and electromechanical power steering. Depending on the model, these may also include a gear shift indicator, automatic air valve control, a high-efficiency rear differential, a map-regulated oil pump, a pressure/rev-regulated electric fuel pump, a self-disconnecting air-conditioning compressor and tyres with reduced rolling resistance. The Automatic Start/Stop function, which switches off the engine when it is stationary at traffic lights or in slow-moving traffic, is included as standard in the new BMW 1 Series, with both manual and automatic transmissions. ECO PRO mode, which is activated by the driving experience switch, adjusts the engine map, heating, air conditioning, and mirror/seat heating to minimize fuel consumption. The resulting increase in range is shown on a display. As a result, the new BMW 1 Series will embody the concept of fuel-efficiency like no other premium car, building on the strengths of its predecessor in this area. At a later date, the range will be expanded with the BMW 116d EfficientDynamics Edition. This will be powered by a 1.6-litre diesel engine, and feature a number of fuel-saving and emission-reducing technologies, including solutions to further optimize drive-train efficiency, improve aerodynamic performance and reduce rolling resistance. The BMW 116d EfficientDynamics Edition will have an output of 85 kW/116 hp, with fuel consumption of 3.8 litres per 100 kilometres and CO2 emissions of 99 grams per kilometre over the EU combined cycle (provisional figures). The standard six-speed manual petrol and diesel versions of the new BMW 1 Series offer efficient power transmission and precise gear changes. 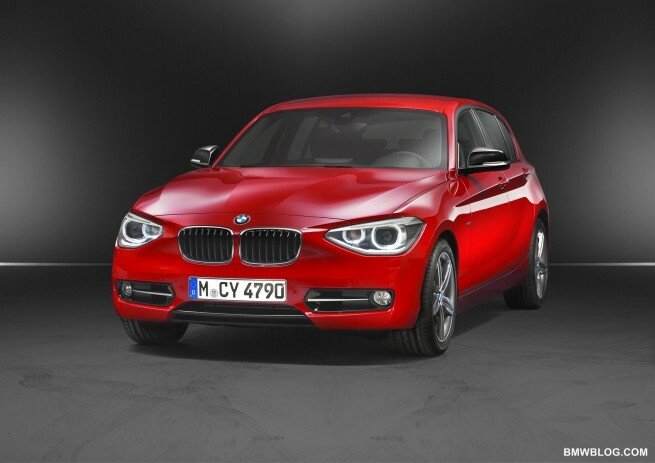 The BMW 1 Series is also the only compact car also available with the option of an eight-speed automatic transmission, offering fast, smooth gear changes and excellent fuel efficiency. The innovative architecture of its wheel set allows more gears and a better spread of ratios, with barely any increase in weight over the existing six-speed automatic gearbox for the BMW 1 Series. The unusually high efficiency of the eight-speed automatic transmission means that fitting it to the most powerful new BMW 1 Series models actually results in lower fuel consumption and CO2 figures than with a manual transmission. The Steptronic function used in the automatic transmission allows gear changes to be initiated manually using the electronic selector lever. A further option is the eight-speed sports automatic transmission, which enables even more dynamic gear changes, and includes shift paddles on the steering wheel. The new BMW 1 Series boasts best-in-class suspension technology, with a double-joint cross-strut front axle with McPherson struts and sway bars, and a five-link rear axle. The high aluminium content of the front axle structure effectively reduces the unsprung mass, while noise levels have also been reduced and crash performance improved. Both the front and rear axles have double elastic bearings and extra-large bearing blocks for increased comfort and responsiveness. The new BMW 1 Series has a wider track than its predecessor (51 millimetres wider at the front, 72 millimetres wider at the rear), and the almost perfect 50:50 weight distribution helps to translate the dynamic advantages of the rear-wheel drive layout into an exciting and agile ride. The new BMW 1 Series has electromechanical power steering as standard, combining typical BMW precision with very low energy consumption. The optional Servotronic function provides speed-dependent power assist. Variable Sport Steering, also available as an option, reduces the number of steering wheel rotations required to make sharp turns. In this mechanical system, steering ratios are adjusted using a variable steering rack. Parking and turning are safer and easier, requiring minimal steering effort, but the typical BMW steering precision and directional stability at high speeds are maintained. 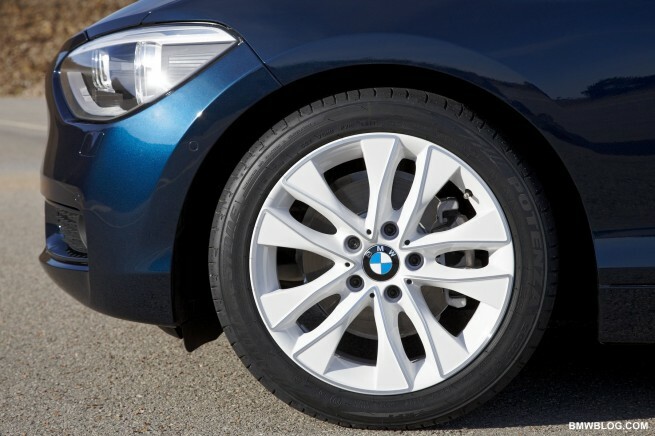 As an alternative to the standard 16-inch wheels, the new BMW 1 Series is also available with 16, 17 and 18-inch light-alloy wheels. Its responsiveness and powerful braking in emergency situations are partly due to DSC Dynamic Stability Control, and the car also has ABS anti-lock braking, DTC Dynamic Traction Control, CBC Cornering Brake Control and DBC Dynamic Braking Control. Other features now include braking assistance, fading compensation, brake drying and hill assist. DTC mode increases the intervention thresholds of DSC, making it easier to drive on loose sand or deep snow. By allowing slight slippage of the drive wheels, it also facilitates controllable oversteer. DSC Off mode activates the electronic rear axle differential locking system. If either of the drive wheels suffers wheelspin while accelerating through tight bends, brake force is applied to this individually, so that the opposite wheel maintains traction. The new BMW Series 1’s lightweight body makes it more agile and improves passenger safety, with high-strength steel being used to increase torsion resistance and the strength of the passenger safety cell while minimising weight. Crumple zones and clearly defined load paths absorb the force of an impact and deflect it away from the passenger cell. The standard safety package comprises front airbags, side airbags integrated into the seatbacks, front and rear head airbags, three-point automatic seatbelts in all seats, front seatbelt tension limiters and pre-tensioners, and an ISOFIX child seat mounting system in the rear. The new BMW 1 Series’ high-tech presence is reflected in an impressive range of driver assistance and mobility services which is unique in a compact car. The BMW ConnectedDrive options network the driver with the vehicle and the outside world to improve comfort and safety while providing a wide spectrum of information and entertainment. The Adaptive Headlight function incorporated in the optional xenon headlights adjusts the illumination depending on the vehicle’s speed, steering angle and yaw rate. At low speeds, the turning lights integrated into the foglamp illuminate the road in the direction of travel. Other features include rain sensor, automatic headlight control, high beam assistance, park distance control, which allows safe, precise parking, with the image from the reversing camera appearing on the iDrive control display. Park assist aids parallel parking by identifying suitable spaces and steering the car into place if required. Cruise control with brake function controls the engine and brakes while setting the optimum automatic gear to maintain the speed selected by the driver. The Lane Departure Warning facility now incorporates Collision Warning, which uses a camera at the bottom of the rear-view mirror to monitor the road markings and prevent unintended changes of direction. The camera also monitors other vehicles and, if required, sounds a two-stage alarm to prevent collisions. A visual warning appears on the instrument panel if a minimum distance set by the driver is not maintained, and a flashing symbol and acoustic signal are activated if avoiding action is required. The Speed Limit Info system has been expanded, with symbols on the instrument panel showing known speed limits and no-passing signs above or beside the road as recorded by its camera. Innovative technology has been used to facilitate the integration of Apple iPhones and other smartphones and music players, including online services. BMW Apps allow iPhone users to receive web radio stations and display Facebook and Twitter posts on the onboard monitor. Another new function, Real-Time Traffic Information, provides detailed congestion data and recommended diversions. The new BMW 1 Series also has unlimited Internet connectivity, another unique feature within the compact segment. High-quality standard features include driving experience switch, air conditioning, and keyless ignition. The new BMW 1 Series offers all the excitement of premium-quality, pioneering technology and exceptional driving pleasure within a compact car, with many superior features as standard and a wide range of attractive options. The driving experience switch, a standard feature located on the central console, tailors the car’s settings to the driver’s personal tastes, including engine characteristics, DSC driving stability control, optional Servotronic settings and automatic gear change programme and dynamics. COMFORT, SPORT and ECO PRO modes are included as standard. The eight-speed sports automatic, Variable Sport Steering and BMW Sport Line versions also have SPORT+ mode. Cars fitted with the Professional navigation system have a sport display on the control monitor showing real-time engine performance and torque. The standard equipment of the new BMW 1 Series also includes remote-controlled central locking, height-adjustable driver’s and front-seat passenger’s seats, electric wing mirrors, electric front and rear windows, BMW Business radio and CD, six speakers and an AUX IN connection, and air conditioning. Options include two-zone automatic air conditioning, electrically adjustable and heated seats, multifunction steering wheel, automatically dimming rear-view and wing mirrors, foglamps, electric sunroof, and towbar with removable ball. 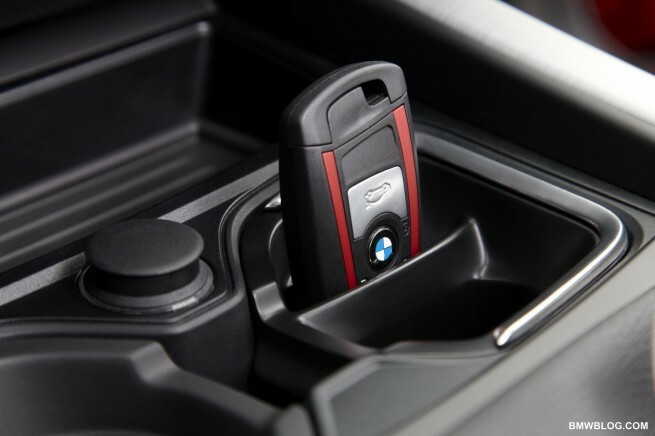 The engine of the new BMW 1 Series can be activated by touching the Start/Stop button as soon as the keyless remote is inside the car, making traditional ignition key insertion redundant. The optional Comfort Access system automatically locks and unlocks the car. The Professional navigation system includes a hard disk. Individual entertainment features include a DVD changer, DAB receiver, and 360-watt, digitally amplified 12-speaker Harman Kardon hi-fi system. Like its five-door predecessor, the new BMW 1 Series is made in BMW’s Regensburg assembly plant, together with the BMW 3 Series saloon, coupé and convertible, the BMW M3 and the BMW Z4. The plant has produced more than 4.5 million automobiles in its 25-year history.